MARC FABER BLOG: Marc Faber : The Chinese Economy is Growing at maximum 4 percent per annum, not 7.5 percent or 7.7 or 7.6 percent. 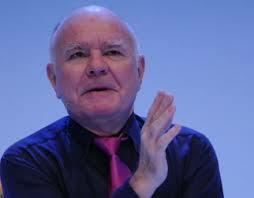 Marc Faber : The Chinese Economy is Growing at maximum 4 percent per annum, not 7.5 percent or 7.7 or 7.6 percent. SMN: Because really, at this point, you can’t really believe what they’re saying. Marc Faber : The Chinese are not completely dishonest, but if you read between the lines of the hard-core statistics in China, in my view, they don’t match with the public statistics about GDP growth. The economy is growing at say, maximum 4 percent per annum, not 7.5 percent or 7.7 or 7.6 percent.